With breast augmentation and tumor removal the #1 procedures in cosmetic surgery and reconstructive surgery, respectively, according to latest ASPS information, this issue on breast augmentation presents discussion of procedures for cosmetic enhancement and for breast reconstruction. 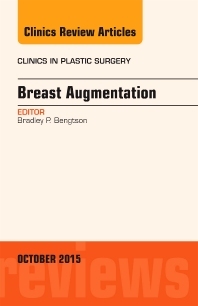 The first section includes topics such as: Evolution and Future Development of Breast Implants; Standardization of the Bra Cup; Process of Breast Augmentation with Special Focus on Patient Education, Patient Selection and Implant Selection; Etiology & Prevention of Capsular Contracture; 3-D Imaging and Simulation in Breast Augmentation: What is the Current State of the Art? ; Fresh Look at the Anatomy of the Chest Wall with Special Attention to the Pectoralis Major and Infra-Mammary Fold with Implications to Breast Surgery; Differences between Saline & Silicone Implants that Most Plastic Surgeons Don't Know; Shapes, Sizes, Shells and Surface and the Selection Process of Breast Implants; Shapes, Proportions and Variations in Breast Aesthetic Ideals - definition of breast beauty: analysis and surgical practice. The next section presents surgical approaches and techniques for breast implant surgery: Teaching Breast Augmentation What are the Critical Intra Operative Steps & Decision Making: Maximizing Results and Minimizing Revisions; Mastering the Nuances of Highly Cohesive Shaped Breast Implants; Strategies, Challenges and Solutions in Augmentation Mastopexy Patients: The Most Difficult Primary Breast Procedure; Use of Scaffold Support of the Breast in Primary Augmentation Mastopexy; Considerations and Improvement of Breast Asymmetry in Primary Augmentation; Surgical Strategies in the Correction of the Tuberous Breast; Subfascial Apprach to Breast Augmentation with Lipofilling of the Breast; Surgical Approaches to Breast Augmentation: Surgical Options for Incisions & Planes; Fat Grafting / Fat Transfer to the Breast; Use of Barbed Sutures in Primary Augmentation and Mastopexy. The final section presents special situations in surgical procedures: High Resolution Ultrasound and the Detection of Breast Implant Shell Failure; Breast Implant Associated ALCL.